I’m launching some watercolor videos (as well as Copic!) for the Holiday Backgrounds Series – see them all HERE. If you’ve tuned in to my YouTube channel much, you’ll know how much I love Clearly Besotted stamps…and Stephanie, the owner, blesses me with the new releases to feed my addiction. (Thank you, Stephanie!) 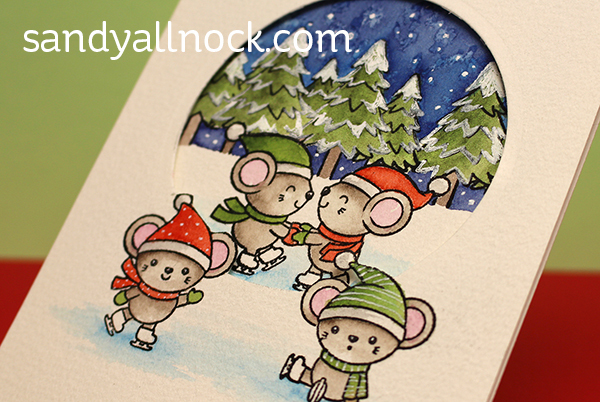 These adorable little mice had to go to an ice skating party – and I’ve been wanting to do a little partial-diecutting anyway, so let’s get to it without further ado! (Mistake included in the video…along with puppies!) Watch the video below or click HERE to see it in HD on YouTube. There are lots of stamps you can do this partial die-cutting technique with – but these skaters are so cute, you might not be able to resist, eh? Amazing work as always Sandy! so cute, I just love the scene on the front and through the window! I love the way the sky turned out. Would have thought you did it on purpose! Your new babies look like a loving handful. So much fun, made me laugh to see them play together. Its nice that they get along. Love the card & love the dogs. Hope you all have a long and happy life together – so nice that they are already fast friends. Darling card. I really like seeing how you create scenes for the images. It adds so much. I like the use of the partial die cut and seeing how you did that. Thanks! Please tell me the breed of your puppies. They are wonderful. Thank you. The little guy is a golden retriever. The other is a rescue, no idea what she is. I enjoyed this very much. The partial die cutting is a great idea . Thanks for yet another great video. Pat the pups for me. I have 4 dogs ;-), 3 Greater Swiss Mountain dogs and a miniature Schnauzer. My crew are the BEST! Have a great day. The puppies are cute, cute, cute! What a happy handful to have right now! Wonderful as usual. Really like when everything doesnt go perfect cause you alwsys share great ideas to recover. I think the sky turned out great. I like the layered look of the blues. TY for sharung all these backgrounds in the different mediums. Looking forward to so many more. God Bless you and the cutest pups. Your card is as adorable as your puppies!! So cute! I get so many thoughts in my head from you. Thank you. 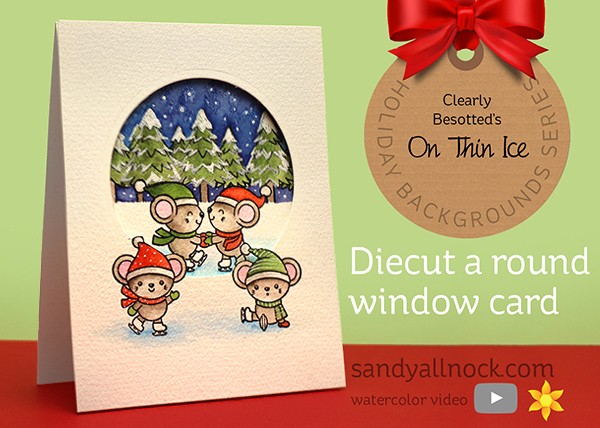 Also love your meeses to pieces, as some cartoon character from my childhood would say – nothing cuter than Christmas mice, in my humble opinion and cutting the heads out of the “window” is a great idea. Looking forward to even more backgrounds – thank you for all the great ideas you bring!